Statistics: Informed Decisions Using Data, Fifth Edition, gives students the tools to see a bigger picture and make informed choices. As a current introductory statistics instructor, Mike Sullivan III presents a text that is filled with ideas and strategies that work in today’s classroom. His practical emphasis resonates with students and helps them see that statistics is connected, not only to individual concepts, but also with the world at large. MyLab™ Statistics for this edition takes advantage of data analytics to add additional exercises to high usage chapters. New Technology Support Videos show the author demonstrating easy-to-follow steps to solve a problem in several different formats—by hand, TI-84, and StatCrunch™. MyLab Statistics from Pearson is the world’s leading online resource for teaching and learning statistics; it integrates interactive homework, assessment, and media in a flexible, easy-to-use format. MyLab Statistics is a course management system that helps individual students succeed. It provides engaging experiences that personalize, stimulate, and measure learning for each student. Tools are embedded to make it easy to integrate statistical software into the course. And, it comes from an experienced partner with educational expertise and an eye on the future. Note: You are purchasing a standalone product; MyLab Statistics does not come packaged with this content. Students, if interested in purchasing this title with MyLab Statistics, ask your instructor for the correct package ISBN and Course ID. Instructors, contact your Pearson representative for more information. With training in mathematics, statistics, and economics, Mike Sullivan, III has a varied teaching background that includes 15 years of instruction in both high school and college-level mathematics. He is currently a full-time professor of mathematics and statistics at Joliet Junior College. 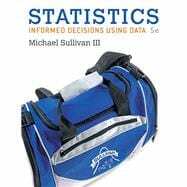 Mike has numerous textbooks in publication in addition to his Introductory Statistics Series, which include a Developmental Math series, and a Precalculus series, which he writes with his father, Michael Sullivan. Mike has built this book in the classroom, using feedback from his students. He is well aware of the challenges of students taking an introductory statistics course. His goal is for students to be more informed interpreters of data, so that they will be better decision-makers and have stronger critical-thinking skills. When not in the classroom or writing, Mike enjoys spending time with his three children, Michael, Kevin, and Marissa, and playing golf. Making an Informed Decision: Where Should I Invest? Case Study: Evaluating Alabama’s 1891 House Bill 504.